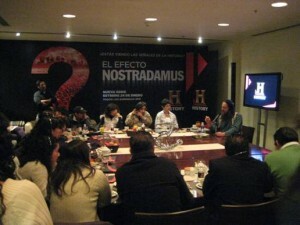 In early December, a few days after releasing my 16th book (and sixth eBook) Predictions for 2010, I received an invitation from History Channel to represent the series in their publicity campaign for Latin America. I felt honored being only one chosen from the series’ assembly of good prophetic scholars (and the unavoidable inclusion of a few popular and charismatic quacks spouting 2012 hysteria) to speak for the series in a press conference held in Mexico City. I was told History execs admired my balanced approach to controversial prophetic subjects. For the record, I’m sure some of you would disagree with their assessment and think me a pontificator. At least I will do you all a favor and supply what I wish my colleagues and competitors on these Nostradamus/prophecy shows would qualify. None of us can really call ourselves the unquestioned messengers of long dead prophets who, if raised from the dead, Nostradamus and all, might pick their own bones of contention and throw them at our heads for what we “declare” was meant in their prophecies. Your own intelligence, I hope, spares us the need to proffer redundant reminders that we scholars are offering our opinion — even when it seems many of my colleagues believe otherwise and think their utterances are gospel. Just know that when anyone asks me what Nostradamus said my answer is the same I gave to 18 journalists from across Mexico and Latin America in the conference pictured above. He says nothing for a very long time. He’s been dead for nearly 450 years. I’m the one making statements here and they should be measured for their efficacy or fault upon the merits or merda of my intuition and scholarship by the test of time. I flew into Mexico City for the first time a fortnight ago. Being a native Southern Californian (born in Hollywood, CA in 1955) I’ve deep down felt that I was not only an American by birth but also a citizen in spirit of Mexico. California was theirs before it was unilaterally seized in the American empire fever of the Mexican-American War of the 1840s. It was good to fly into Mexico City overnight and be in the vibe and heart of Mexico in the wee morning hours of 12 January. That morning, looking beyond the wall-sized window of my magnificent 17th floor suite in swank Hotel W, mind and heart tried to imagine the Mexico of earlier times hidden beyond the veil of overpopulation, congestion and pall of smog that reduced visibility to a mere few miles. There would be no perchance to imagine views of a sprawling plateau of the Aztecs at a airy thin altitude of 7,300 ft. (2,240 meters) surrounded by mountains and picturesque volcanoes, such as 17,800 foot (5,426 m.) Popocatepetl. My lungs and throat, already constricted by an oncoming head cold now seized, sucked hard and sighed thin, smoggy air in disappointment. At breakfast I met my American, History Channel publicist for the event, Rosemary Ravinal (A&E Ole Networks) from Miami and our Mexican hosts Daniel Garcia and Esteban Beulo of Beuló PR & Communications for breakfast and a round of Hotel W huevos rancheros. In my case, the “W” stands for Wow! I finished the huevos and could tell my hosts that now this Gringo from El Norte can say he’s had REAL Mexican food and not that oversized, over-cheesy-entombed, love-handle bun-busting, lard dripping Godzilla sized dollops we call “Mexican” food in the United States. Real Mexican food his handed to you in modest palm-full servings with a sprinkling of cheese that even this Vegan who eats eggs can enjoy. American Mexican food going for the big and loud flavors misses the subtleties in texture and tastes inherent in authentic Mexican fare. Rosemary, Daniel and Esteban in our first actual meeting beyond the electronic remoteness of fax, email, phone and blackberry, planned the schedule of events for this day and the news conference for the next. They showed me the special room for the conference, which at the time was bare and uninteresting. Boy! Was I in for a surprise the next morning of the conference when Daniel and Esteban’s PR team performed their magic! On the first day, Rosemary devised a plan to mix tourism with work and through the magic of her blackberry. We hired a car to tour the city. I did my first interview (to Sao Paulo, Brazil) standing on a street in the old federal district of Coyoacán. The title comes from the Nahuatl Coyohuacan meaning, “place where they have coyotes.” The first Spanish conquerors of the Aztec empire built the earliest part of the colonial Mexico City there. Nostradamus was still a teenage student of Avignon University when Hernán Cortés and his lieutenants built their sprawling mansions where coyotes once forlicked nearly five centuries ago. Beauty is where you look for it in the third largest and certainly the highest in altitude megalopolis in the world with 22 million people crammed and coughing under fowl fumes and ramshackle storefronts and crumbling apartments obscured behind a blight of huge billboards. An abstract Aztec rendering of a grasshopper (a Chapol). Mexico City has my sympathies. I am the son of another generally ugly sprawling metropolis, Los Angeles. There is beauty there if you know where to find it. Coyoacán is Mexico City at its most beautiful and oldest colonial charm. Yet, I get ahead of myself. Before Rosemary and I wound through crowded streets to get there, Juan, our chaffeur and tour guide took us to see the rock outcropping known in the Aztec Nahautl language as “Grasshopper Hill” (from the Nahautl Chapul-grasshopper, tepec-hill). Juan, a knowledgeable and grand old gentleman, said the Aztecs had a love for eating roasted grasshoppers. Soon the Chapul disappeared down Nahautl exulting mouths and in their place on the hill, they constructed a large temple in their honor. After the Spanish came the temple monument was pulled down and its foundation used to raise Chapultepec Castle, the site of one of the last battles of the Mexican-American War. When we approached it, the very spot where our car got stuck before a red light in traffic happened to be the point where the American Nathaniel Currier had composed his tinted lithograph (c. 1847) of the then Mexican Military Academy with flagpole running up the US flag after American forces had charged up into the castle. 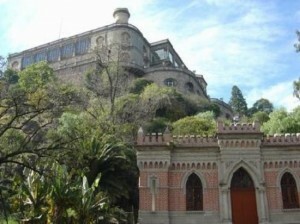 There they clashed with six teenage Mexican cadets making their last stand in the tower. They are known in Mexico as Los Niños Héroes (the child heroes). The last boy warrior took down the Mexican flag, wrapped it around his body and jumped from the tower so the Americans running up the stairway tumbling over the bodies of his companions couldn’t capture it. It is said the American commander, Winfield Scott, saluted the flag wrapped corpse as he rode past to occupy Mexico City. Later, Chapultepec Castle became the palace residence of Mexican presidents and foreign usurpers, such as Archduke Maximilian of Austria and his fetching wife Princess Charlotte/Carlotta (played famously going mad by Betty Davis in the movies). The Mexican people overthrew these puppets of French Napoleon III and his Mexican monarchists allies in 1867. Chapultepec’s new tenant then became President Benito Juárez, the Abraham Lincon of Mexico. The turreted castle much redesigned by Maximilian radiates old world charm above the basalt brick foundation and parapets dipping down into an oasis of forested parkland — the realm of big eared squirrels, cockerels and parrots whose calls remind me of the parks of Pune, India, where I spent many years with my meditation teacher, Osho. Pune and Mexico City happen to be at nearly the same subtropical latitude. Next stop after grasshopper hill, some coyote magic to be had where the coyotes once roamed. In part two of this three-part series, I’ll write about my pilgrimage to the house of one of the best coyote spirits of them all. PS–Have you seen the Nostradamus Effect? If Spanish and Portuguese is your mother tongue, check out the television overview of each episode in Spanish I have placed at this link: El Efecto Nostradamus. 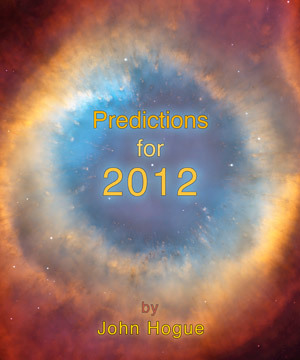 Check out Las prophecías del 2010 in English. This entry was posted in Prophecy and tagged A&E Network, Chapultepec, Coyoacan, El Efecto Nostradamus, Emperor Maximilian, Frida Kahlo, History Channel, Juarez, Los Ninos, Mexican-American War, Mexico City, Nostradamus, Ole Network, prediction, predictions for 2010, prophecy, Sao Paulo, WInfield Scott. Bookmark the permalink. Post a comment or leave a trackback: Trackback URL.